Umbro unveiled the new Manchester City away kit for the 2011/2012 season last night during the Sky Blues’ FA Cup homecoming at the City of Manchester Stadium. 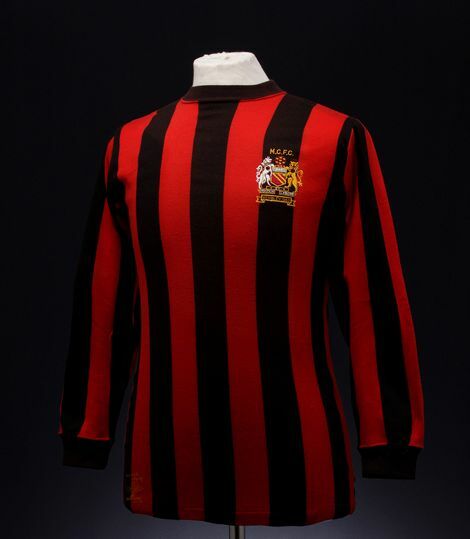 Back in Black and Red, Umbro say that the inspiration for the new Manchester City away shirt is taken from the most famous shirt in the club˘ history Ĺ› the' 1969 and 1970 striped jersey in which City won the FA Cup, League Cup and European Cup Winners Cup. 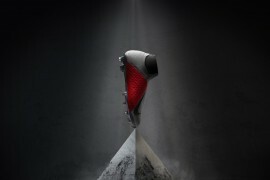 Umbro, once again sticking by their ‘Tailored by’ moniker that has seen them so resurgent in the last few years, had their kit designers drap black and red fabric over the silhouette of the modern day ‹Ĺ›arms out˘€žË goal celebration to create the distinctive striping of the new Manchester City away shirt. The shirt is designed so that when a player celebrates a goal or links arms with team mates, the black and red stripe remains consistent. For this reason, there is no seam on the underarm as traditionally stitching can distort the shape and flow of a stripe, which also enhances comfort. 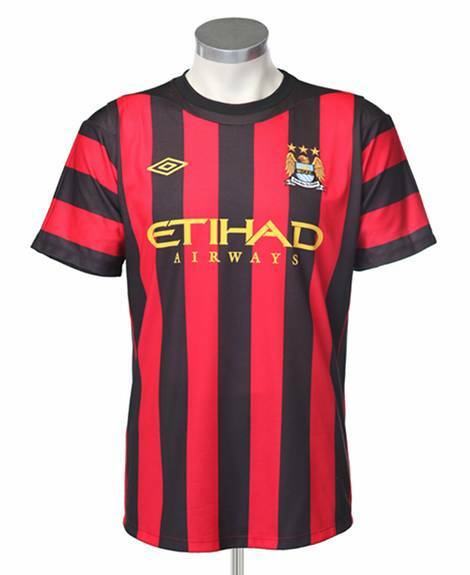 The stripe width on the new Manchester City away shirt was inspired by the old 1969 kit. The long sleeve version features an all-black forearm so that there is a unified stripe-look when the players link arms in goal celebrations, which is certainly a bold and unique move by Umbro in pursuit of their vision for the kit. The club crest and sponsor detail is key-lined in gold in order to give standout against the black and red. 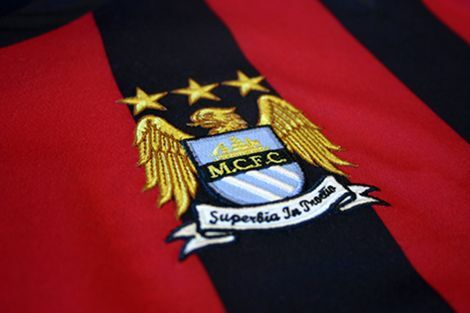 City˘ home colour, sky blue, is featured within the crest so that the new Manchester City away shirt always carries a piece of ‹Ĺ›home˘€žË. Black stitching is used on the cuff of the shirt and an equal amount of black and red is featured on the hem. 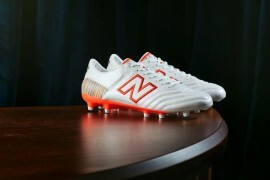 David Blanch, Senior Designer at Umbro, said: ”Umbro˘ kit designs for City are centred on being modern Ĺ› not retro. So with this shirt, we married the aesthetic of the 1969 shirt with the modern day ‹Ĺ›arms out˘€žË goal celebration. The result is a shirt which is a celebration of both the future and the past. 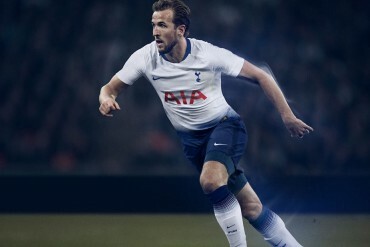 ”This is a football ‹Ĺ›shirt˘€žË in the truest sense Ĺ› we have combined modern day football tailoring to end up with a shirt which combines both performance and smartness. Stretch mesh is a key component to allow players to move freely and their skin to breath during matches. Every minor detail within the new Manchester City away shirt has a reason for being Ĺ› nothing is simply ‹Ĺ›there˘€žË. The shorts are plain black and include the club crest whilst the socks are black and similar to the shirt, feature two bands of red. The new Manchester City away shirt is available for pre-order now and will be on sale from 23rd June.